As anticipation builds for the 2019 Super Bowl, it’s time to start thinking about where you’ll watch the big game. Lucky for you, we’ve taken care of that question for you – because your Super Bowl will be best spent at Clique Bar & Lounge. We do parties and celebrations in a big way here, and the 2019 Super Bowl? It will be an event that you won’t want to miss. Clique is located right in the middle of the Strip, making it easy to gather with friends and football fans. There’s sure to be plenty of activity all day long, so you can head up and down the Strip before joining us for the game. Because Clique is right in the heart of The Cosmopolitan on the casino floor, you can easily try your luck at the casino earlier in the day. Then hopefully when you join us at Clique, you’ll have a little extra cash in your pocket, and maybe you’ll bring your team some of your luck, too. Great drinks are a must-have for the Super Bowl, and your choices are just about endless here at Clique. Maybe you want to start the night off with one of our signature cocktails, crafted by our expert mixologists. With choices like the Dr. Cel-Ray Pepper, Your Girl’s Favorite Shake, and Peanut Butter & Jealous, you just can’t go wrong. Beer more your style? Our menu is full of great choices, including domestics like Budweiser and Michelob Ultra, imports like Corona and Stella Artois, and craft beers including Brooklyn Brown, Goose Island IPA, and Elysian Space Dust IPA. The very design and layout of Clique makes it the perfect place to view the Super Bowl. Kick back and relax on our couches and comfortable chairs, or take up a seat at the bar. Our spacious lounge allows you and your friends to claim your own area, but you can also easily socialize with other sports fans. Once you’ve found the perfect seats, we don’t blame you for not wanting to leave them. That’s why we will mix your cocktails, tableside! This tableside mixology brings a mixologist right to your table, making each drink into a true experience. Watch and learn as our mixologists show you the secrets that go into the preparation of each perfect cocktail. You can ask about the ingredients, the preparation techniques, and why your cocktail has that amazing flavor. With each drink mixed right there in front of you, you’ll get an up-close look at the art of mixology. And if the game should go into overtime like Super Bowl LI? Well, you’ll start to appreciate how comfortable our seating is, we’ll bring you another round of drinks, and we’ll all keep the party going until the game does come to an end. We know you won’t want to miss a minute of the action – or of the infamous Super Bowl commercials – so we’re bringing in extra TVs to provide you with the ultimate Super Bowl and commercial viewing experience. There won’t be a bad seat in the house – we promise – so you and your party can cheer on your team with a clear view of a TV. No Super Bowl viewing experience is complete without some delicious football favorites, and we’ll have a great selection of bar food that is classic, delicious, and with a bit of an upscale flair. Enjoy our Mini Sliders, Buffalo Chicken Wings, Pizza Pockets, and Pigs in a Blanket. These plates are perfect for splitting with your whole group. Victory is sweet, so don’t forget to end the night with a great dessert. Our Deep Fried Oreos are served with Nutella sauce and marshmallow crème. Or, choose our Crispy Apple Pie Wontons served with salted caramel sauce and Bavarian whipped cream. Either way, these dishes are full of flavor and are the perfect way to celebrate your team’s victory. On Sunday, February 3rd, join us at Clique for Super Bowl LIII. The Super Bowl is a must-do experience regardless of whether you’re a football fan or not. 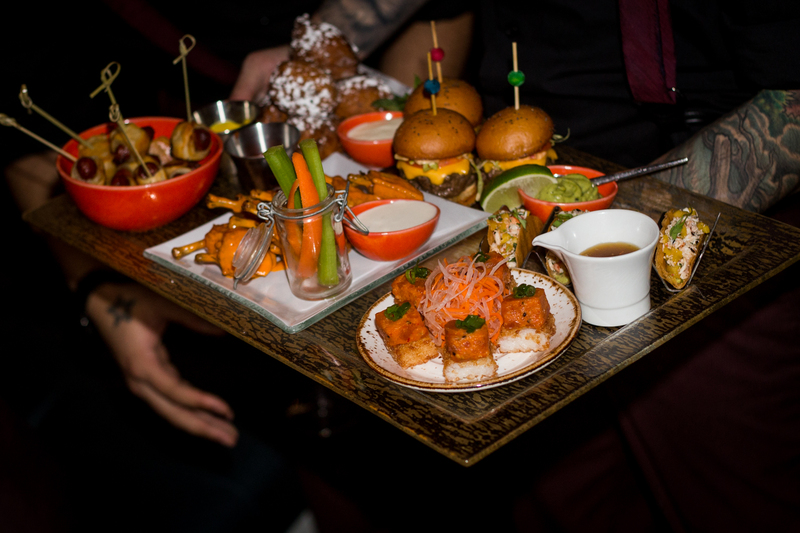 With Clique’s amazing atmosphere, delicious bar food, and tableside cocktails, this is sure to be a Super Bowl that you won’t soon forget.